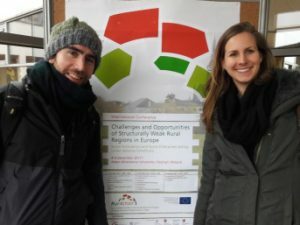 | The first get-together of the ten early stage researchers (ESRs) of RurAction was in the context of the international opening conference in Poznań, Poland. From 4–6 December 2017 an international conference with the topic “Challenges and Opportunities of Structurally Weak Rural Regions in Europe. Social Innovations and Social Enterprises Acting Under Adverse Conditions” was hosted by the Adam Mickiewicz University, Poznań. During 3 days, internationally renowned researchers from different disciplines such as sociology, human and economic geography, political sciences and business studies met up with practitioners from award-winning social enterprises. Presentations of research results about rural development stimulated the discussion on the role of social enterprises and social innovation in structurally weak rural regions and our understanding of these phenomena. As an example for a necessary complementarity between theory and practice the sessions at Poznań were followed by a field visit to Wągrowiec. This municipality is located in the Pilski subregion – a structurally weak rural region in north-eastern Wielkopolska, 55 km north of Poznań. The municipality of Wągrowiec is a place where social enterprises such as “Common Success” have successfully implemented social innovations. Accompanied by a group of very friendly translators, we had the opportunity to visit one of the workplaces of “Common Succes”. This cooperative aims to empower local people from socially excluded groups (e.g. mentally disabled) through providing training and creating employment in different sectors. Furthermore, there was some time to socialize with the residents of Wągrowiec, who showed us some impressive aspects of their local culture (http://www.wagrowiec.eu/en). From 6 to 7 December furthermore our first internal seminar took place where we were trained among other things in research ethics and data protection, good scientific practices, the visual research strategy as well as comparative research designs. The conference, the excursion and the seminar marked an inspiring start of our project. Our thanks goes out to the local organisers, Prof. Dr. Tadeusz Stryjakiewicz, Dr. Łukasz Rogowski, Wojciech Dyba and all the volunteers.